Add to my favorite sellers. 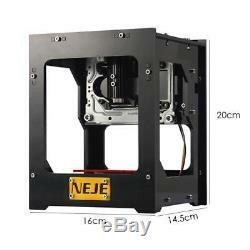 NEJE DK-BL 1500mw USB Bluetooth Laser Engraver Advanced Laser Engraving Machine Wireless Bluetooth Printer Feature: 1. Built-in 6000mAh polymer li-ion battery, providing 4A output, High power and can carve anytime anywhere. 42 x 42x 78mm Caving Space. 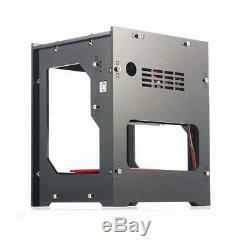 With 108 screws and alloy structure make it strong, also you can design your structure in the machine. Offline power cut memory function, If the battery power is insufficient, usb a mobile power or a 5V1A supply, it will continue to carve, one button to operate. 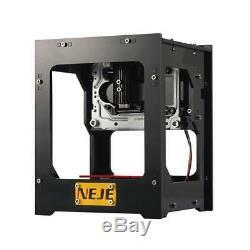 Lone time use, NEJE developed the professional power IC and radiator, carving time will last much longer and carving performance will be more stable than other laser. Great for image engraving and depth engraving, extremely wide scope of application. Objects that can be carved include hardwood, plastic, bamboo, rubber, leather, paint metal, miniature engraving, cutting paper, etc. Support Win 7, XP, Win 8, Win 10, IOS 9.0 and above, Android 4.0 and above. Specification: Brand Name: NEJE Model: DK-BL Frame Material: Acrylic acid+ Aluminum + Stainless Steel Main Color: Black Net weight: approx. 1.6kg Product size: approx. 14.5 x 16 x 20cm/5.7x6.29x7.87'' Power: 1500mW Bluetooth: 4.0 Supporting OS: Support Win 7, XP, Win 8, Win 10, IOS 9.0 and above, Android 4.0 and above. Battery: 6000mAh Polymer Li-ion Battery Battery working time: about 3 hours DPI: 350dpi Carving Space: 42x42x78mm/1.65x1.65x3.07'' Laser Wavelength: 405nm Temperature: 500 Support Software: NEJE Bluetooth laser engraving machine Supported Image Formats: JPEG / BMP(24 bit only) / TIFF / PNG (32 bit or less) / PCX(8 bit and 24 bit RLE) / PCD Image Size: 512 512 pixels Image Engraving Pattern: Bitmap Carving Input: One USB(5V 0.5A) Laser Can Be Replaced: YES Every Work Time: < 1 hour Laser quality assurance time: 3 months Certificate: CE / FDA Note: Please allow 1-3mm differs due to manual measurement. Due to the different display and different light, the picture may not show the actual color of the item. 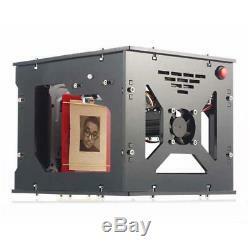 1 x Engraving Machine 1 x Laser Protective Glasses 1 x USB Cable 1 x Allen Wrench 1 x CD Driver (Software/APP/Manual) 1 x User Manual. Please contact me before you return it. If item is defective after 3 months, you can still send it back to us. We will send you a new one after receiving the defective item. If you do not receive our reply, please kindly re-sent your message and we will reply to you as soon as possible. If you have any problems or concerns whatever with your order or products, please message us and give us a chance to assist you before you leave any feedback. We believe we can produce a positive outcome to any situation and will work hard to earn your praise. Our office hours are 9:00 a. M to 6:00 p.
We apologize for the late reply during the holidays. The item "NEJE DK-BL1500mw USB Bluetooth Engraver Laser Engraving Machine Wireless Printer" is in sale since Monday, July 16, 2018. This item is in the category "Business & Industrial\Printing & Graphic Arts\Screen & Specialty Printing\Engraving". The seller is "careforyou123" and is located in Hong Kong. This item can be shipped worldwide.